Just Curves - Home of the Curve Master Presser Foot and other tools for easy designing, cutting and sewing of quilt blocks with curves. Thank you for coming to our website. We offer sewing and quilting tools with a specialized niche for sewing curves. Our key quilting products include the Curve Master Presser Foot, the famous Seam Roller, and acrylic templates and patterns by Just Curves. . These tools make cutting, sewing and quilt designing easy for even beginners. Click the "Shopping" tab at left to start! 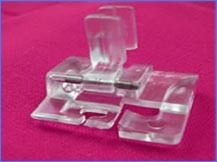 The Curve Master Presser Foot is a new sewing technology to sew any 1/4" or 5/8" curved seam without pinning! It also does perfect straight seams. It adapts to fit any home sewing machine regardless of brand or age of the machine. It is the brainchild of Sandy Chandler. As a quilter of some 20 years, she was frustrated when making a Double Wedding Ring Quilt and came up with a better "mousetrap." The Curve Master was introduced at Houston Quilt Market in October 2002 and has become the #20 top selling sewing and quilting notion, according to a leading notions distributor. Just Curves was established by Sandy in 2003 as a retail and wholesale outlet for the Curve Master and other specialized tools for patchwork. Just Curves also provides an educational presence at many quilt shows per year demonstrating the Curve Master. Just Curves maintains this safe and secure web store for your shopping convenience. We offer wholesale to qualified buyers. We invite you to browse under the Shopping tab to the left. Sandy teaches nationally and internationally at many quilt shows and at quilt guild meetings and workshops. 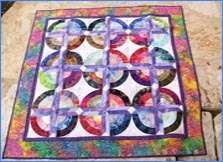 She has appeared on many quilting TV and internet programs. Contact her to arrange classes for your guild. Many videos featuring the Curve Master can be found at: www.justcurves.wordpress.com. Just Curves is in Debary, FL. Curve Master LLC provides manufacturing, warehousing and distribution in Pensacola, FL. Imagine sewing any CURVE with no pinning! Imagine perfect, consistent 1/4" seams, both STRAIGHT and CURVED. The Curve Master Presser Foot does that and more! Just Curves brings you tools for making curved patchwork: accurate tested acrylic templates, patterns, books, and more. Shop here!